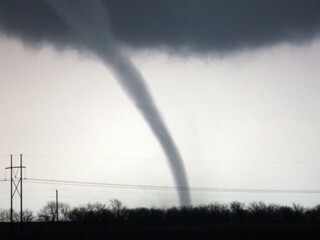 WICHITA, Kansas, March 16, 2008 - New research suggests wheat fields may play a role in starting tornadoes. "I myself am probably a little skeptical but again it’s something that's going to require more research, to say that wheat fields are responsible for tornadoes. I don't think that is the case,” said KSN meteorologist Andrew Kozak. Data collected over a six year period in Oklahoma shows that the moisture in the air above wheat fields is much higher than surrounding areas, and that plays a role in tornadoes. There are a lot of factors influencing a tornado. Among them-- dry air needs to mix with warm, moist air. Since wheat gives off a lot of moisture when it greens in the spring, researchers say it could be part of the fuel that fans the flames of a twister. While some say that theory is a long shot, others say it makes sense. “There is a lot of evidence that could point towards that. Most tornadoes come through this time of year in April and May and if you're linking that to the stages of wheat in this wheat belt, that's about the time the wheat is most active,” said Adam Jeffris of the Anthony co-op. The devastating tornadoes in central Kansas last May support this idea, while other instances do not. For example, northwest Kansas produces less wheat than a lot of other areas around the state but recorded the most tornadoes. This leaves some to believe more research is needed.